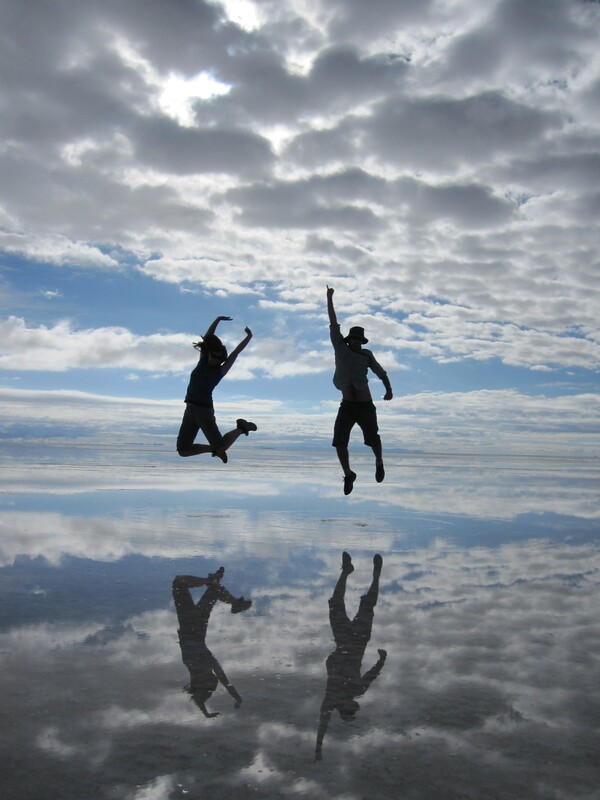 Salar de Uyuni- a mirror on the world. So after over 24 hours on the go, starting with a bus from Ariquipa to Tacna (Peru), then a taxi collective over the border to Arica (Chile), then an overnight bus from Arica, we finally arrived in San Pedro de Atacama at 10am on Monday. The journey, although long, was bearable. Although we did have to get off the bus with all our bags to pass through a regional checkpoint once we got into Chile at 4am! I swear Chile is more fussed about travel within their country than across their borders, quite ridiculous! So San Pedro is a small travellers town, full of people in their 20´s, found either in the main square watching the world go by or on bikes peddling along San Ped´s dusty dirt roads. The town is within the Atacama desert, the most arid desert in the world, and the sun is strong, the air dry and the sky a perfect powdery blue. Most buildings are single storey and called ´adobe´ houses with interior yards and roofs made of clay and hay. Everything is either white or an earthy reddy-brown colour; against the bright blue sky, is a pleasure on the eyes. First night in San Pedro we stayed at Hostel Campo Base, which was a comfortable hostel with a lovely cleaner-come-cook-come-tourist-information-point called Marie who made amazing scrabbled eggs! We also found a great restaurant called ? on the plaza, where you can sit and people watch and which serves great comfort food in massive portion…very welcome after 24 hours travelling and 2 days of little eating after being poorly! Tuesday marked the start of our 4 day, 3 night tour into Bolivia through Reserva Nacional de Fauna Andina Eduardo Avaroa and to Salar de Uyuni. Our tour company (Cordillera Traveller) picked us up from our hostel at 8am and took us through Chilean immigration which was 10 minutes out of town…yet another Chile exit stamp in my passport! It was then another 30 minutes to the Bolivian immigration point, in the middle of nowhere- desert all around with 1 stone building with ´Immigration Boliva´painted on the side! Needless to say the border crossing was easy, 1 form to fill in and 1 stamp in the passport. Then it was time to transfer our bags and ourselves from the mini bus into the 4×4´s which would be taking us through the reserve and salt plain over the next 3 days. We were a group of 11 so they split us up into 2 4×4´s. In our 4×4 we had Catalina and Fred from Portugal and are Ryan Air air stewards, and Rachel and Acil from Perth. Rachel we found was originally from Wales, moving over to Perth when she was 12. But she had Cymru tattooed on her wrist so I think she is still a die-hard Welshy! Our driver was called Celso and spoke no English, so Fred was appointed official translator and tour guide sitting in the front with Celso and asking our various questions about the landscape we were travelling through. He was a complete star the whole 3 days. So the landscape in the Reserve is barren desert, but not in an ugly way. Like San Ped´everywhere was a reddy-brown earthy colour, with naturally coloured mountains of green, orange and red smudges and bright reflective lakes throughout. First stop on our tour of the Reserve was Laguna Blanco. As the name suggests it was a white lake, the bolsite mineral in the water making the water look white. It was so reflective that it acted like a mirror to the sky and the flamingo´s that resided there. Then it was back on the 4×4 to the next lake called Laguna Verde. This lake was a gorgeous aquamarine colour which looked extremely vivid against the sand colour of the mountains that surround it. The turquoise colour comes from the copper and sulphur minerals in the water. On the way to the hot springs, our driver pointed out an area of rock formations which had inspired a lot of the surrealist Salvador Dali´s paintings. There are 2 rocks standing tall which are called ´the twins´, and apparently Dali saw himself as their brother…odd if you ask me, but he was a surrealist after all! The hot springs, called Termas de Polques, were sulfurous water pools at 4200 meters, naturally hot at 30 degrees. We couldn´t spend too long in them (20 mins) as at altitude just sitting in the pools wipe you out. Although feeling exhausted afterwards, it was lovely sitting in them and chatting to the others on our tour. There was just one more stop before lunch which was at the Sol de Manana Geysers at 4950 meters- the highest point of the tour. 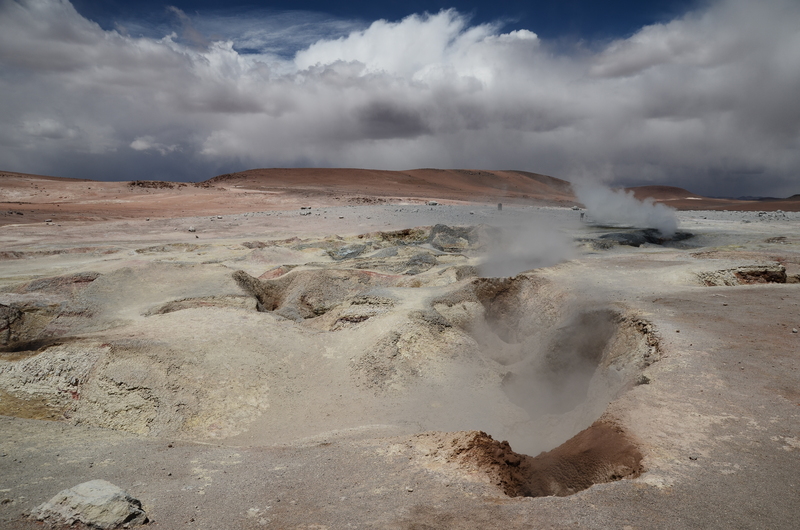 These were boiling mud pots and sulfurous fumaroles which let off plumes of gas which smelt like rotten eggs! We had to be careful around them as the ground can be unstable and our driver told us a true horror story of a tourist who fell in and got burnt from head to toe and they had to send for a helicopter from La Paz, but that took 3 hours….needless to say we were careful! Our stop for lunch was the last stop for day 1, at our hostel for that night in the middle of nowhere! Our group of 11 spent the afternoon and evening playing cards. Food was pretty basic but not inedible. And after dinner we went outside to star gaze. One word, wow! The sky was packed full of stars, like a dome of stars surrounding you as you looked up. We saw the milky way too, it looks like a patch of cloud in the sky of otherwise canvas of sharp glints of light (the stars). So day 2 began with a false start. Acil´s alarm went off and diligently we all got up and got ready for the day. 20 minutes later we realised it was actually 5 o´clock and not 7 o´clock when we needed to be up. So we all went back to bed in our clothes for 2 hours! Acil got confused with the Bolivian time difference (1 hour behind Chile time), bless her! Anyway when we then got up, it was a quick breakfast and back onto the 4×4´s to explore further the Reserve. First stop was to Laguna Colorado which got nominated for 1 of the new 7 wonders of the world. It didn´t get onto the final list, but it is easy to see why it made the shortlist. The lake is massive and a pinky-red colour due to the minerals in the water. It’s just 30 cm´s deep and reflects everything, and is full of flamingo´s. 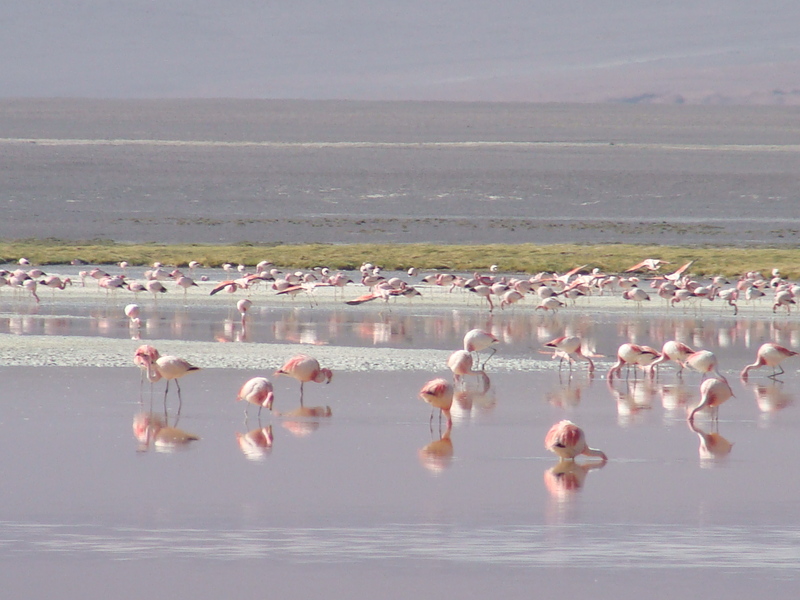 1 million flamingo´s across the whole of the reserve, with the majority living in Laguna Colorado. We saw all 3 varieties of flamingos- the Flamenco Andino (with black tails), Flamenco Chileno (more white) and the rarer Flamenco de James (more pink). It was really cool seeing them in flight. They look super funny when they land; like they are landing on hot coals, their feet move up and down and you can imagine they are squawking “ooh, ahh, ouchh”! 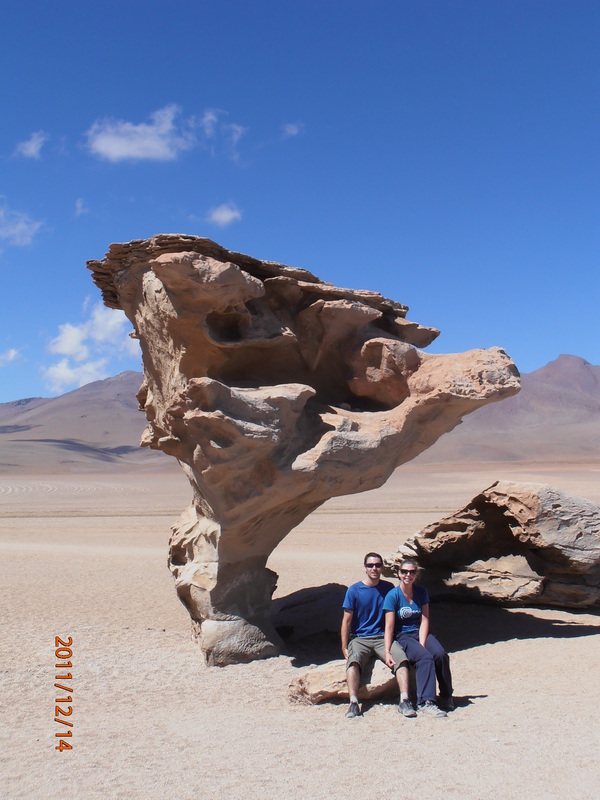 Next stop was at the Arbol de Piedra, which is a rock which has been eroded by the wind and now looks like a tree. It really did look like a tree, fair play, and was the nearest thing to vegetation in an otherwise arid landscape, even if it is rock! We then travelled across the Altiplanic (a platform at altitude) stopping off at the 3 altiplanic lakes called Canapa, Hedionda and Honda. They were much the same, but not as impressive as Laguna Colorado. After lunch (where I tried to pretended the grit in my pasta was pepper- inevitable hazard in a desert! ), we stopped off at a view-point to see the Abaroa volcano. It is still active and had a small plume of gas coming off it which was a bit ominous. So we were quick to get back on the 4×4 to make our way to the edge of the Salar de Uyuni. This wasn´t before stopping within a mini salt plain, with a random set of train tracks running through it (I have no idea where it led or came from), and Fred taking a turn at driving the 4×4 (we stopped just before San Juan town so Celso, our actual driver, wouldn´t get in trouble)! 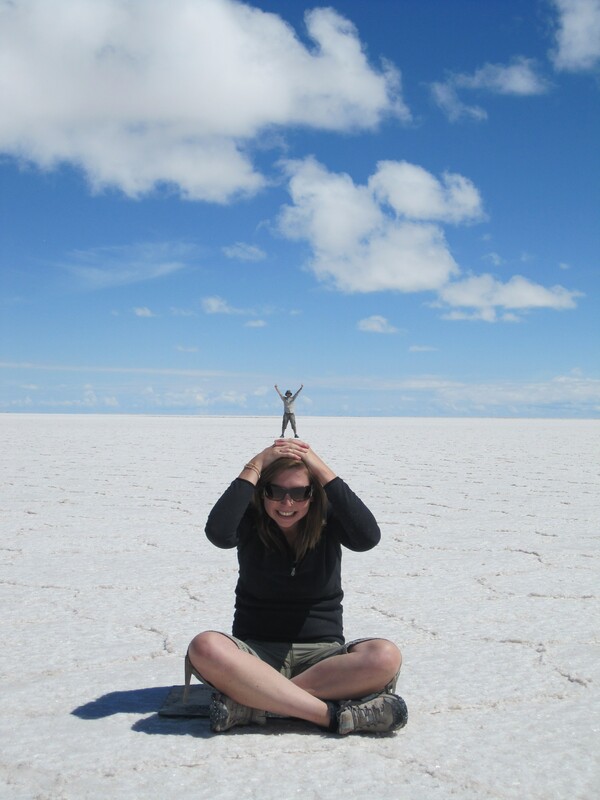 That night we stayed at Hotel de Sal on the edge of the Salar de Uyuni. The whole building is made from salt blocks, including all furniture inside, and complete with a loose salt floor. It was pretty impressive, although the loose salt floor a little impracticable! Day 3 of the tour and also Catalina´s 23rd birthday and we had cake for breakfast! Fred also, rather resourcefully, fashioned up 2 candles from a cork which was very sweet. 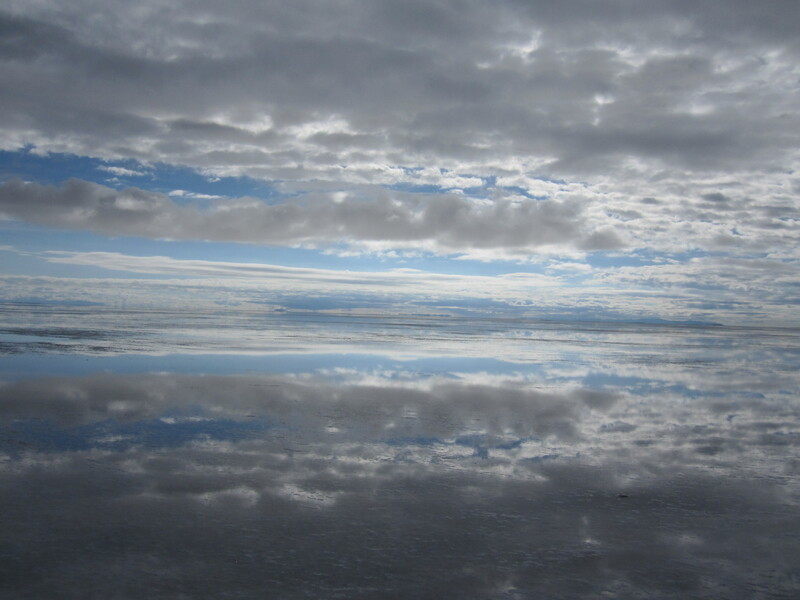 We were off by 7am and right into the Salar de Uyuni. The Salar is the world´s largest salt flat covering over 12,00 square meters and rests at 3653 meters high. It was part of a prehistoric salt lake called Lago Minchin which covered most of South West Bolivia, and was fed by Lake Titicaca in its day, but which has now dried up. And this has created a massive white salt surface i.e. Salar de Uyuni! Now this is meant to be one of the dryest places in the world, but lo and behold it rained over night creating a shallow film of water over the salt plain. This only meant that the salt plain was even more reflective. You couldn´t see where the salt plain finished and the sky began and in the morning sun it looked even more spectacular. The place was horizonless. I can only imagine this is what people in the olden days felt when they set sail, thinking the world was flat. You really felt that any moment the 4×4 would just fall off the end of the plain! We all had fun creating novelty photographs on the plain as a group. Jumping, creating the evolution model all of us in a line and playing around with perspective so it looks like you were standing on people’s heads or sitting on people’s hands. It was good fun! As we continued to drive across the salt plain, we kept seeing graves marked with a cross. Our driver said that these marked places where people had lost their lives on the plain. For example, quite recently 2 american tourists who hired their own car to drive across the plain, got lost, decided to sleep in their car and died of exposure…nasty! Near the centre of the plain, it began to dry up as the sun had evaporated all the rain from the night before. The ground looked like icy snow and crunched slightly when you walked on it. We then stopped at the Museo de Sal which used to be the first salt hotel on the Salar called Hotel Playa Blanca. However it got closed down as its sewerage polluted the salt pan. Consequently the authorities banned the building of hotels in the middle of the Salar, and instead they are only allowed to build around the edges. Right outside of the hotel/museum was a mound of salt, upon which lots of flags from around the world were flying. 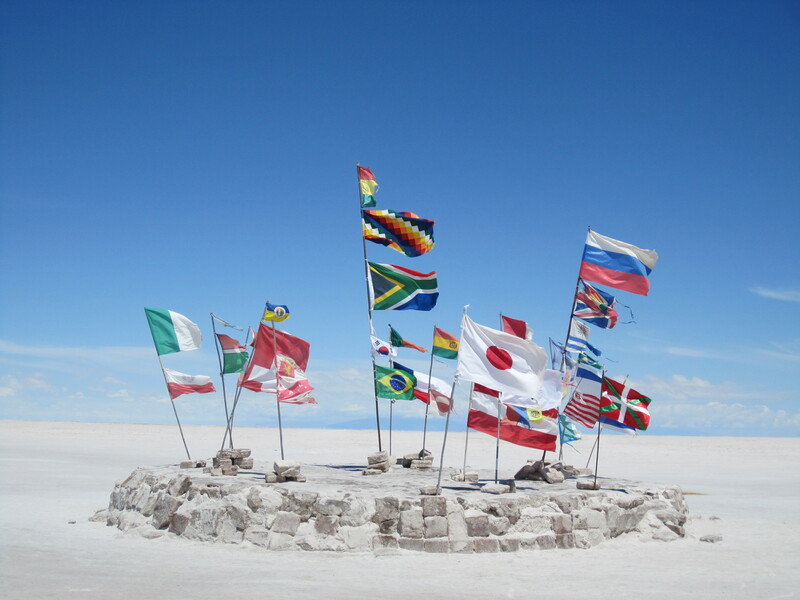 The multi-colour of the flags against the blue sky and white plain looked out of this world. Very cool. Although the Union Jack looked like it had seen better days! Next stop on the Salar was to what they call the salt eyes, where water underneath the salt plain bubbles up creating little volcanoes of water. Right next door to this was a salt mine, where we saw a man with a shovel who´s job it is to scoop up the salt into piles which then get collected to be processed for table salt. Fred got talking to him and found out that he works 16 hour days in the same 5 meter by 5 meter area of the plain! When asked whether he enjoyed working mining salt, he answered “he has to eat”. We then left the plain and had lunch at the salt town called Colchani. 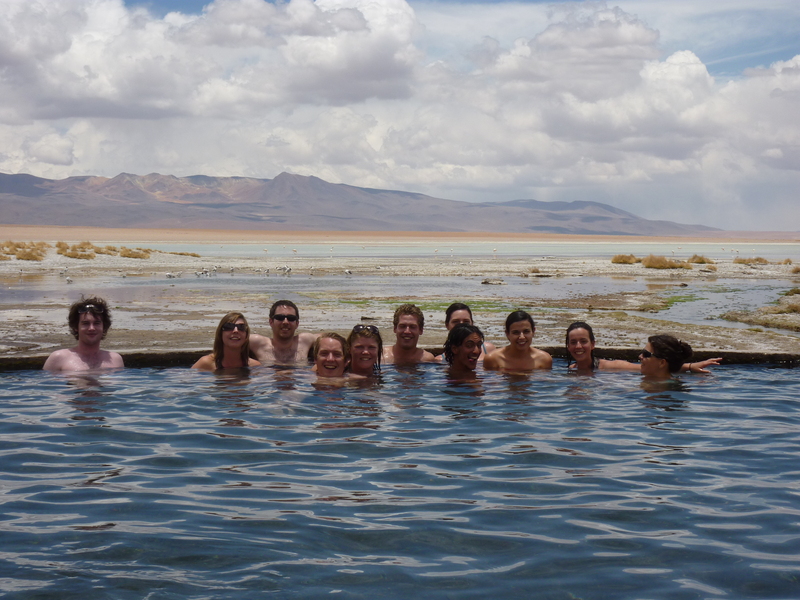 Then it was off to Uyuni town, the last stop on our tour. They took us to the outskirts of the town to a place they call the train cemetery. It is the place where all the coal powered trans were taken to be dumped when they were no longer needed after the Pacific War and then again when electric trains were introduced. It was quite an unreal sight seeing lots of different trains, carriages and engines just sitting there in the middle of nowhere. However many of them had a lot of graffiti on them which made the place look even more neglected and the surrounding area was dotted with garbage which wasn´t very nice. So all in all we were pleased to get back to the main square of Uyuni (although the town itself is a bit neglected too!) for our debrief and good byes with the guys and gals in our group. It was just Hedd and I and a swiss lady called Astrid which was making the trip back to San Pedro, the rest of the group was heading further into Bolivia. So after 1/2 hour it was back into a different 4×4 with our new driver Ronald to head back to Chile. After 4 hours of travelling we arrived in a small town called Villa Mar where we were having an overnight stop over. By 8.30pm we were in bed to prepare for our 4am wake up to continue the journey to Chile. We went to bed with the stars and woke up with them. Sun rise was around 5.30am and only then did it start to warm up. It was a pretty chilly trip up till then! We got to the Bolivian border by 9.30am, got another stamp in our passports, said bye to Ronald our 4×4 driver and then onto a minibus to take us the rest of the way. Crossing the Chilean entry border was laborious but fine and we finally arrived in San Pedro at 1 pm. A long day and it wasn´t even past lunch time! But it was an ace tour and we chilled for the rest of the day looking over our pictures from the trip. Our remaining time in San Pedro has been a very relaxed affair. Sleeping in, strolling around the dusty streets and lazing about in the plaza. We had booked to go on what they call a ´star tour´last night, where you got taken into the desert and shown the nights sky plus a trip to an observatory. However it got canceled at last minute due to over 50% cloud cover! Very bad luck seeing as most world class observatories are based in the Atacama desert due to its reliability of over 300 days clear skies a year! ´C’est la vie´ as they say. In conciliation, Hedd downloaded a Solar System Advent Calendar App on his ipod and I got to open 17 doors at once whilst listening to some Christmas tunes…I got up to the planet Saturn! So today we are off on a 23 hour bus journey South to a place called Vina del Mar, just north of Santiago. I feel like I´m on the wind down now after our gallop around South America. We´ve packed heck of a lot in and still 2 more places to see. But just 6 more days until we fly to Fiji…that´ll be a big change! Weather= Fierce sun in the day but blooming cold at night! 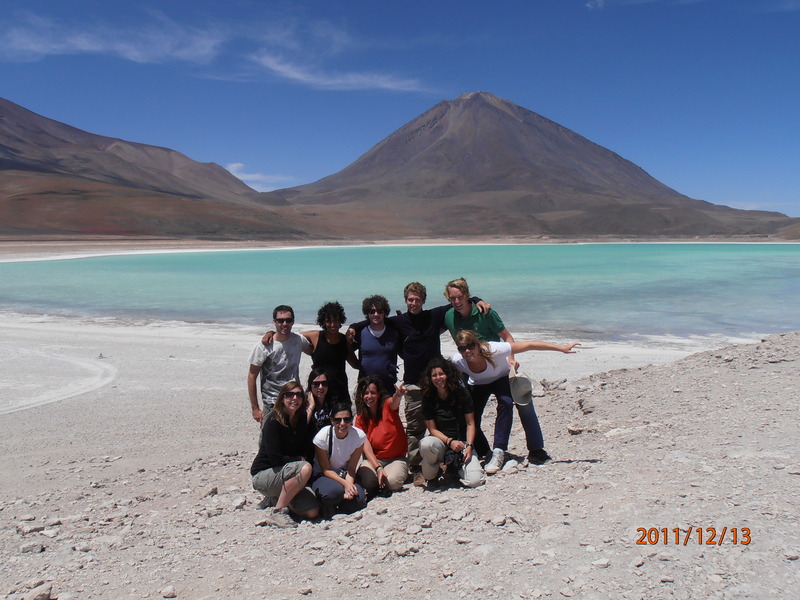 When I decided a long time ago now that we should do the Salt Plains tour into Bolivia, I did so on the basis that we would be visiting one of the driest places on earth, it was even described alien environment. So on the 3rd day of our tour I was quite disappointed to be informed that there had been a lot of rain and that we would be unable to visit certain parts of the “Salar”. However my disappointment soon vanished as we drove into the Salar”, which covered in water, looked like an endless lake on one side and and like I would imagine the North Pole on the other side. When we stopped it was surreal, the water reflected the sky perfectly to the point where it was hard to tell where the sky ended and the earth began. Magical. We were then informed that the tours would have to stop in a few days because the water would be too deep. So instead of feeling disappointed, I now feel lucky to have experienced something only a few people a year will get to see.